We Manage The Snow So the Snow Doesn't Manage You !!! Our four decades of experience in snow and ice management and removal in the harsh winters of Northeast Ohio means your business is in good hands with Abraxus Snow and Ice Management. Snow and winter weather should never stop your business, so we don’t let it—ever. Your choice in partner is a critical decision. Whether you operate an office or residential complex, hospital network, medical facilities, retail establishment, shopping mall or other commercial property, we know you can’t afford to have weather-related business interruptions. Furthermore, you can not have employees or customers experience unsafe conditions. Abraxus has the experience and expertise to handle not only the storms but your high expectations. Abraxus has built its business reputation on consistent performance, fair pricing and loyal customer service. 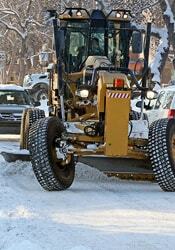 Through these efforts, we have become the area leader in corporate and institutional snow removal. Our commitment to innovation is indicative of our performance. Precise forecast monitoring allows our dedicated drivers, most of whom have been with Abraxus for more than 15 years, to proactively prepare to clear the way. 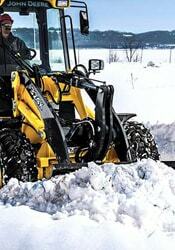 Abraxus Snow Removal is about more than simply moving snow. After four decades in the business, we have an unparalleled knowledge, instinct and track record of battling the most severe winter storms. 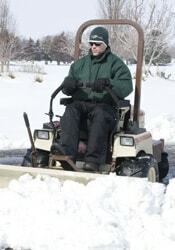 That’s why we are one of the largest and most trusted Cleveland snow and ice management service providers. Winter storms can occur at any time of the day or night. With the lack of precision associated with local forecasts, we closely monitor the latest AccuWeather and national weather service reports. Since we operate a 24 hour day, 7 days a week, our salt distribution facility (Abraxus Salt. LLC) never closes. We even communicate with other contractors to monitor isolated and/or widespread events. This critical preparation and unique situation makes a tremendous competitive difference in how each event is strategically approached, and allows Abraxus to be there right when you need us. As winter storms rage, Abraxus Snow & Ice Management services clear the way by utilizing more than 400 pieces of snow removal equipment to provide: snow plowing, snow removal, snow relocation, sidewalk service and de-icing services. Whatever your business needs to be prepared during a winter storm and offer a safe environment for staff, customers and vendors, we will work with you to make happen. When the skies clear, Abraxus truly proves quality service and experience matter. For budget purposes, next day reporting is available for service and material usage. If questions or concerns arise, we make sure client contact occurs immediately. That’s why clients continue to place their trust in Abraxus’ Cleveland Snow & Ice Management services. We are there for you and your business through every storm and every question. Let us prove it today. Budgeting each year for winter weather issues is often a frustrating experience for any organization since each season is so unpredictable. Because of this a snow and ice management contract is an absolute necessity. Per Occurrence: Specified terms for each winter event based on ice and/or snow accumulation or other predetermined expectations. Seasonal: Set price for the season with a fully defined and monitored scope of services for removal and de-icing chemicals. Can Snow Companies Be Green?